Discover TUI's incredible summer deals. 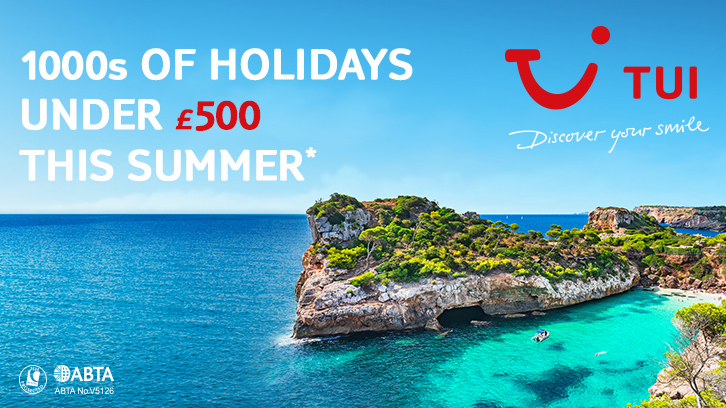 *1000s of holidays under £500pp offer applies to new bookings only on selected TUI package holidays, departing from Manchester Airport between 1st May and 31st October 2019, subject to availability. Excludes flight-only, accommodation-only and packages booked with a third party flight. Saving is based on a minimum of 2 adults sharing a room. Offers may be amended or withdrawn at any time. Please see www.tui.co.uk or the relevant brochure for full booking terms and conditions that apply. All the flights and flight-inclusive holidays are financially protected by the ATOL scheme. When you pay you will be supplied with an ATOL Certificate. Please ask for it and check to ensure that everything you booked (flights, hotels and other services) is listed on it. Please see our booking conditions for further information or for more information about financial protection and the ATOL Certificate go to: www.caa.co.uk. TUI is a trading name of TUI UK Limited, a member of the TUI Group. Registered office: Wigmore House, Wigmore Lane, Luton, Bedfordshire, LU2 9TN. Registered in England No: 2830117. ATOL 2524, ABTA V5126.